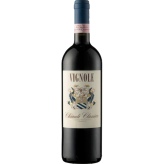 Tenuta di Vignole is a Chianti Classico specialist situated in the heart of the region, near the town of Panzano. This is the Conca d’Oro (the Golden Basin), known for it’s prestigious wines. The soil here, in the low-slung plain along the river Peza, is rich in limestone and carbonate-riddled marl, well-drained and ideal for growing grapes. The winery is owned by the Nistri family, whose deep roots in the local wine industry date back to 1865. The property covers 21 hectares, 14 of which are planted to grapevines: Sangiovese, Cabernet Sauvignon, Merlot, and Trebbiano. Fruit here is picked by hand through September and October, and fermented by plot in concrete vats. The wines macerate on skins for 15 days, then age separately in French oak barrels and casks. The winery itself, housed in the property’s original villa, combines cellars dug deep into the surrounding hillside circa 1500 with smart investment in modern winemaking equipment. In these caves, wines age in bottle for two years prior to release.